A full field of 14 3-year-olds, along with one Also Eligible, will begin the Road to the Kentucky Derby in Saturday’s Grade 3, $200,000 LeComte Stakes at Fair Grounds. The race is the first of three prep events at the track and awards Kentucky Derby points to the top four finishers based on a 10-4-2-1 scale. The LeComte, which will be contested at 1 mile and 70 yards, highlights a 14-race card filled with stakes events. The event is set for race 12, with a local post time of 5:49 PM Central Time. The Mark Casse-trained War Of Will enters this contests off of an impressive maiden special weight win in his last start. The son of War Front started his career on the turf, where he was a runner-up finisher as a maiden in the Grade 1 Summer Stakes at Woodbine. After two more failed stakes attempts on the turf, Casse moved him to the dirt, where he romped to a 5-length win. Assistant trainer David Carroll was high on the horse after a recent work at Fair Grounds. Perhaps the field’s most impressive last-out race comes from Plus Que Parfait, who narrowly lost the Grade 2 Kentucky Jockey Club Stakes at Churchill Downs by a late-charging neck. Two races back, he recorded his first victory in a strong maiden special weight at Keeneland while going two turns for the first time. The son of Point of Entry seems to be developing quite well heading into this race. When it comes to class, the Bret Calhoun-trained Mr. Money has an edge over the field. After breaking his maiden at Churchill Downs on September 28, the Goldencents colt went straight to the Breeders’ Cup Juvenile, where he finished a respectable fourth considering the tremendous jump in class. That type of effort is a good sign for the LeComte, which will serve as a class drop. The full field for the LeComte, from the rail out: Wicked Indeed, Malpais, Tackett, Mr. Money, Night Ops, Hog Creek Hustle, Roiland, War of Will, Mo Speed, Chase the Ghost, Tight Ten, Plus Que Parfait, Manny Wah, Admire, and West Texas (Also Eligible). #8 War of Will – After several near-misses on turf, this horse broke his maiden on the Churchill Downs “Stars of Tomorrow II” card on dirt in what was easily the most impressive effort of his career, as he cruised home to win by 5 lengths. He has also proven to be a classy individual, having competed in the Breeders’ Cup Juvenile Turf one start prior, where he finished fifth. His win was over a sloppy track, which is the main concern coming into this event, but I thought that his win was the most impressive performance of the entire “Stars of Tomorrow II” night. #3 Tackett – After two straight wins going this distance and at this track, Tackett must be taken seriously. His inside post position draw could be tough because of his early speed, and it may cause jockey Joe Bravo to make a decision very quickly whether to go to the lead or try to take back. If he can navigate a clean trip, then this horse will be there in the end. He continues to train well leading up to this race and could be a nice up-and-comer. 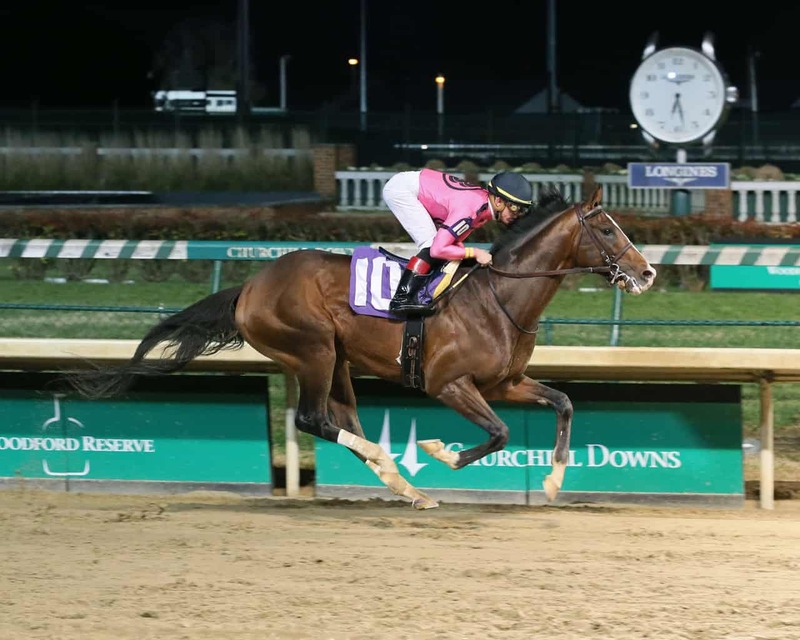 #12 Plus Que Parfait – He showed that he was for real last time out with a nice runner-up effort in the Grade 2 Kentucky Jockey Club Stakes at Churchill Downs. Before that, he broke his maiden at Keeneland, beating a next-out winner named Harvey Wallbanger by a nose. There is no question that this horse improved when stretching out in distance, and there looks to be a lot of pace here, so he could get a really good setup. He will prove dangerous when the real running begins late in the stretch. #7 Roiland – This will be his second straight attempt against stakes company after a fifth-place finish last time out in the Grade 2 Kentucky Jockey Club Stakes. He lost all chance after breaking slowly in a large field of 2-year-olds, but despite the rough trip, he still was able to give a respectable showing, which should set him up for a solid effort here. He will come running late. #11 Tight Ten – There is no doubt that the shorter Kentucky Derby prep races should be where this horse excels. He is most likely distance-limited; however, his early speed going this distance could be a threat. The one bad thing for him here is the presence of other speed in the race, which could likely soften him up when the closers come running at the end. He might hang around for a piece of things, but he will not win unless he gets a perfect and unhurried trip. #6 Hog Creek Hustle – We’ll see if his second attempt going two turns works out better than his first. After breaking his maiden, he went straight to the Grade 3 Iroquois Stakes, where he struggled to a 10th-place finish. Since then, he cut back in distance for an allowance win before finishing third in the $50,000 Sugar Bowl Stakes here last time out. He looks like a good underneath candidate; however, that could be his ceiling. #13 Manny Wah – At times, this son of Will Take Charge has looked like a pretty good horse. He has had trouble with consistency, though, which has made him a hard horse to figure out. His local debut at Fair Grounds came last time out in the $50,000 Sugar Bowl Stakes, where he was a solid second to a nice horse in Gray Attempt. If he can build off of that effort, then he could prove tough in that spot. It is important to note that he was fourth to Improbable in the $100,000 Street Sense Stakes, which has proven to be a pretty good race. Not only did Improbable come back to win, but runner-up Trophy Chaser nearly won the $100,00 Mucho Macho Man Stakes in his next start. #2 Malpais – After a so-so debut at Churchill Downs, Malpais woke up in a big way in his last start, making short work of a maiden special weight field here at Fair Grounds. In the end, the final margin of victory was 5 3/4 lengths, as the Hard Spun colt drew off from his rivals with ease. The challenge here will be stretching out in distance for the first time after two starts around one turn, going 6 and 6 1/2 furlongs. His pedigree suggests that getting the longer distance won’t be too big of an issue, though, and his speed figures fit in well for this race. #10 Chase the Ghost – It always dangers to throw out a Dallas Stewart trainee due to his history of major upsets. This horse enters off of a maiden special weight victory; however, it took him five races to pick up his first win. He is overmatched in this spot. #1 Wicked Indeed – He made his debut a winning one, going 6 furlongs at Fair Grounds, before finishing third last time out in an allowance race won by fellow competitor Tackett. Jockey Ricardo Santana, Jr., has jumped off of Wicked Indeed for this race, which is not a positive sign. #9 Mo Speed – After breaking his maiden on the turf two races back, he was able to then win an off-the-turf allowance event last time out over this track. The field scratched down to four horses that day, though, which means that he will have to face a much tougher and larger group. It’s going to be a challenge. #5 Night Ops – This is the lone maiden in this large field. He has hit the board just twice in five lifetime starts, which makes him the longest shot on the board for a reasonable reason.